Crack, Meth and Diet Soda? Drinking diet soda for years takes a toll on the teeth that’s comparable to years of smoking crystal meth or crack cocaine, according to a new case report from a dentistry journal. The report, published in General Dentistry on May 28, shows an addiction to soda may do as much major damage to your smile as a drug habit, and sugar isn’t even the culprit. Teeth are eroded when acid wears away tooth enamel, the glossy, protective layer of the tooth. Without this shield, teeth are more likely to develop cavities, become sensitive, develop cracks or become discolored. The case study looked at the damage in three people’s mouths. One subject was a 29-year-old admitted meth user, and the other person was a 51-year-old who abused cocaine for 18 years. 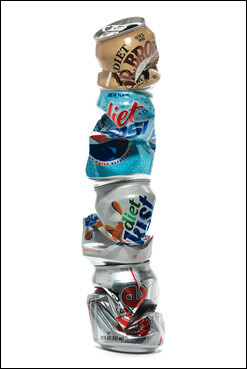 The third patient drank an excessive amount of diet soda, about two liters a day for three to five years. All three had poor oral hygiene and did not visit the dentist on a regular basis. Despite three different substance habits, the subjects appeared to have the same types and severity of damage from tooth erosion. “Each person experienced severe tooth erosion caused by the high acid levels present in their ‘drug’ of choice – -meth, crack, or soda,” lead report author Dr. Mohamed A. Bassiouny, a dentist in Oreland, Pa., said in a press release. The American Beverage Association, however, called the study unfair because the diet soda addict had extremely poor dental hygiene. Bassiouny said the real problem is all three substances were highly acidic. Citric acid is found in both regular and diet soda. The ingredients used to make methamphetamine are highly corrosive, and crack cocaine is highly acidic as well. “The striking similarities found in this study should be a wake-up call to consumers who think that soda — even diet soda — is not harmful to their oral health,” Bassiouny stated. Academy of General Dentistry spokesperson Dr. Eugene Antenucci added that the frequency of diet soda drinking is also detrimental. Antenucci understands that people want to drink soda, and he doesn’t support an outright ban. He just wants to remind people to drink in moderation. If you are going to drink soda, he suggested rinsing your mouth with water after drinking or chewing some sugar-free gum with xylitol, which stimulates saliva.